We’d love your help. Let us know what’s wrong with this preview of The Hypnotist by M.J. Rose. An FBI agent, tormented by a death he wasn't able to prevent, a crime he's never been able to solve and a love he's never forgotten, discovers that his true conflict resides not in his past, but in a Past Life. Haunted by a twenty-year old murder of a beautiful young painter, Lucian Glass keeps his demons at bay through his fascinating work as a Special Agent with the FBI's Art Crime Team. Currently investigating a crazed art collector who has begun destroying prized masterworks, Glass is thrust into a bizarre hostage negotiation that takes him undercover at the Phoenix Foundation dedicated to the science of past life study where, in order to maintain his cover, he agrees to submit to the treatment of a hypnotist. Under hypnosis, Glass travels from ancient Greece to 19th century Persia, while the case takes him from New York to Paris and the movie capital of world. These journeys will change his very understanding of reality, lead him to question his own sanity and land him at the center of perhaps the most audacious art heist in history: the theft of a 1,500 year old sculpture from the Metropolitan Museum of Art. International bestselling author M. J. Rose's The Hynpotist is her most mesmerizing novel yet. An adventure, a love story, a clash of cultures, a spiritual quest, it is above all a thrilling capstone to her unique Reincarnation novels, The Reincarnationist and The Memorist. To ask other readers questions about The Hypnotist, please sign up. A priceless sculpture that hides an ancient secret; an FBI investigator haunted by the past; and a terrorist plot involving the theft of magnificent works of art all combine to create THE HYPNOTIST, the unputdownable thriller and third entry in M.J.Rose's superb Reincarnationist series (The Reincarnationist and The Memorist). No author currently writing in the suspense/thriller category does quite what M.J. Rose does; underpinning her novels is the haunting premise that all of us have past lives A priceless sculpture that hides an ancient secret; an FBI investigator haunted by the past; and a terrorist plot involving the theft of magnificent works of art all combine to create THE HYPNOTIST, the unputdownable thriller and third entry in M.J.Rose's superb Reincarnationist series (The Reincarnationist and The Memorist). No author currently writing in the suspense/thriller category does quite what M.J. Rose does; underpinning her novels is the haunting premise that all of us have past lives that connect us to the present, and within this framework she's conjured a high-stakes world of treacherous business dealings, international intrigue, and the often lethal search for the elusive Memory Tools - objects that can assist people to access their pasts and which, if found and harnessed, could provide their owner with unimaginable power. At the center of this web is Dr Malachi Samuels of the Phoenix Foundation, a gifted yet amoral reincarnation expert who allegedly will stop at nothing to possess the Memory Tools. These entwined themes are spun throughout the series; however, each novel can be enjoyed on its own merits and The Hypnotist is no exception. When Lucian Glass, FBI criminal art investigator, is called in by the Metropolitan Museum in New York City to investigate the horrific mutilation of a stolen painting, he is plunged into a search for the man who, years ago, destroyed his youth and aspiring career as an artist. His investigation leads him back into the elegant, dangerous milieu of the Phoenix Foundation, where a young girl is being treated for nightmarish visions, and the presence of a mysterious woman who might hold the key to his quest. As Lucian begins to uncover a plot centered around a millennial-old sculpture that has surfaced after years of neglect, he finds himself caught up in an intricately linked conspiracy of art smuggling, terrorism, and the race to claim a coveted Memory Tool. True to the author's style, this third installment in the Reincarnationist series keeps her reader off balance with multiple subplots that have seemingly nothing but everything to do with the story. In this case there is an FBI agent haunted by nightmares and a past murder, a bizarre art collector and an ancient statue that holds the key to the much sought after "memory tools". Along with Malachi Samuels, the tools are the common thread to all the books. Given all the action, it's puzzling to m True to the author's style, this third installment in the Reincarnationist series keeps her reader off balance with multiple subplots that have seemingly nothing but everything to do with the story. In this case there is an FBI agent haunted by nightmares and a past murder, a bizarre art collector and an ancient statue that holds the key to the much sought after "memory tools". Along with Malachi Samuels, the tools are the common thread to all the books. Given all the action, it's puzzling to me my indifference to this book. It was difficult to stick with this book, and it took discipline for me to finish before my library due date. I can only say it just didn't do it for me this time. Any of these books do fine as stand alone reads if series just aren't your thing. I broke my own personal record with this winner--couldn't even get through disc 1. I grabbed this one off the library shelf by accident, confusing it with "The Hypnotist" by Lars Kepler. I was bummed when I realized my mistake but figured I'd give it a shot anyway. When the author introduced the first two characters, "Lucien" and "Solange," I knew this wasn't going to happen. Total barf-fest. If my short attention span and book snobbery has prevented me from realizing a masterpiece, then by all m I broke my own personal record with this winner--couldn't even get through disc 1. I grabbed this one off the library shelf by accident, confusing it with "The Hypnotist" by Lars Kepler. I was bummed when I realized my mistake but figured I'd give it a shot anyway. When the author introduced the first two characters, "Lucien" and "Solange," I knew this wasn't going to happen. Total barf-fest. I definitely enjoyed this book in the series the most so far. It felt more real to me than the others. That is a very subjective statement I am aware, but it's the best way to describe it. The Hyponist is a genre-bending thriller by established author M. J. Rose. Although it’s third in The Reincarnationist series, The Hypnotist works perfectly as a standalone despite some recurring characters. FBI special agent Lucian Glass is still in pursuit of Malachai Samuels, a man criminally committed to acquiring a list of ancient Memory Tools that reputedly give a person the power to learn of his or her past lives. A list of those tools could be hidden in a statue of Hypnos, currently held by the Metropolitan Museum of Art and undergoing a dangerous, international dispute of ownership. But more than just a tale of high stakes art theft, The Hypnotist is also about Lucian’s own emotional journey. It turns out that what’s happening in the present day may have all too much to do with what’s happened in the past. You’ll find no fluff in The Hypnotist. Rose switches between different characters and centuries masterfully, and her writing is lean and straight to the point. At first the changing cast of characters confused me, but soon I was swept up into the many energetic, intricately connected storylines. Reincarnation provides a very handy tool for exploring vastly different settings and characters all in one book – you’ll see a little of everything in here. Rose’s knowledge of fine art was also a pleasure to encounter. The politics behind conflicting claims of ownership was fascinating, and though I’m no expert, Rose at least gave the appearance of being authoritative in her explanations. Detailed, real locations like the Metropolitan Museum of Art gave the less plausible scenes some realism, and I had as much fun learning about art and its conservation as I did following the twists and turns of the plot. At the centre of The Hypnotist is an uneasy romance between Lucian and Emeline. Some backstory: when Lucian was a young man, he was badly injured and his girlfriend at the time, Solange, was murdered in an art theft that wouldn’t have happened if Lucian had only arrived on time for their dinner date. Ever since, Lucian’s memory of Solange has filled him with guilt and prevented him from finding a real, adult relationship. Does Emeline possess Solange’s soul, reincarnated? Similarities between the women seem to exceed mere coincidence, but guilt-ridden Lucian doesn’t want to believe he has a second chance to atone for his past. Romantic tension predictably abounds between Lucian and Emeline – but somewhere in the is-this-reincarnation-or-not mystery, Emeline loses any sense of individuality or even personality. She doesn’t act like a reincarnation of Solange’s soul (if, in fact, that’s what she is). Instead, Emeline is more like Lucian’s idealized, teenage memory of Solange: perfect, hazy, insubstantial. The other characters, happily, are much more engaging and unique. Many people believe in reincarnation, and so I hesitate to call reincarnation the unreal element that makes this novel ‘fantasy,’ but apart from reincarnation, there really isn’t anything fantastic – in the magical sense – about this book. The Hypnotist and its characters treat reincarnation in such a scientific, matter-of-fact way that the novel still doesn’t feel like a fantasy even if you do think that reincarnation is supernatural, magical and unrealistic. The Hypnotist is definitely speculative fiction, but that’s about as close to fantasy as this book gets. I had not heard of this book (or the series) until Lisa from TLC Book Tours asked me if I wanted to be on the tour. I’m glad she gave me the opportunity to read The Hypnotist because had it not been for her, I probably wouldn’t have found out about this book otherwise. The Hypnotist is the 3rd book in The Reincarnationist series. I have not read the 1st two books but I had no problem reading this book as a stand alone. The beginning of the book felt like I was getting pulled from all different directions. It was hard for me to follow the storyline at first; it kept bouncing around from one narrative to another in a way that I found somewhat confusing. But once I had my feet firmly planted in the foundation of the storyline, I was ready for the adventure. This took about 50-60 pages. Another thing I had trouble with was following the characters. The main reason being that at one point a character would be referred to by their first name, then at another time by their last name. Because of this inconsistency, I found myself backpedalling to remind myself who a character was. I think it would have been a bit easier to follow if the characters were all referred to the same way - either by their first name or their last. There is enough going on in the storyline that needs my attention; I don’t want to have to constantly think ‘who’s this guy again?". I finally decided to keep a list of characters, to keep everyone straight. A murder, art crime and past life study, what more could you ask except interesting writing and a good plot, which is also here. Lucian Glass is not only an agent with the FBI's Art Crime Team, but he has just lost a special love and has learned of an art theft of several masters. He is on the trail of the art theft when he comes face to face with his own understanding of what is real and what is not. Into the mix is introduced the question of reincarnation and whether or not a piece of sculptu A murder, art crime and past life study, what more could you ask except interesting writing and a good plot, which is also here. Into the mix is introduced the question of reincarnation and whether or not a piece of sculpture really can be owned by anyone. His answers come in a desperate attempt to save the sculpture from theft from the Metropolitan Museum of Art and, at the same time, save the lives of those attending the presentation ceremony. Quotes: "I've read their writings. You believe, and I do, too, that so much of what causes our pain and suffering are unresolved past-life issues carried over into the present. There are tools, Iris, tools that can help us do our jobs, that could help our patients. Tools we could utilize in order to prove reincarnation is real, to prove that you and I and all of us are part of the past and the present and will forever be part of the future. That our souls are part of each other." "It is only art that keeps us immortal." This book is third in a series of books written by M.J. Rose. However, this is the first one I have read. Agent Lucian Glass is on the trail of Malachi Samuels of the Phoenix Foundation who is after the Memory tools that could prove whether people are reincarnated. Lucien’s first love Solange was killed during a heist of a Matisse that was stolen 20 years earlier which may be tied to Samuels’ quest for the artifacts. Lucien becomes involved with Emmeline, who is Solange’s cousin and Lucian starts This book is third in a series of books written by M.J. Rose. However, this is the first one I have read. Agent Lucian Glass is on the trail of Malachi Samuels of the Phoenix Foundation who is after the Memory tools that could prove whether people are reincarnated. Lucien’s first love Solange was killed during a heist of a Matisse that was stolen 20 years earlier which may be tied to Samuels’ quest for the artifacts. Lucien becomes involved with Emmeline, who is Solange’s cousin and Lucian starts to believe that Solange has been reincarnated as Emmeline. Could it be true? Unfortunately, it took me a very long time to get through this book. I don’t know if it was because it was about artifacts and the art world (of which I’m not a connoisseur) or that I had not read the previous two books, or that the story itself seemed to drag on for me and I kept getting everyone mixed up. Nevertheless, it was not a good read for me. This is the third book in M.J. Rose's Reincarnationist series. I have not read the first two, but received a review copy of this one from the publisher through NetGalley.com. A reader can easily jump into the middle of this series, though, after having read The Hypnotist, I will definitely go back and read the first two! The plot is intricate, full of twists and complications that require the reader to be paying attention. While reincarnation is the central theme, we're taken through an ancient w This is the third book in M.J. Rose's Reincarnationist series. I have not read the first two, but received a review copy of this one from the publisher through NetGalley.com. A reader can easily jump into the middle of this series, though, after having read The Hypnotist, I will definitely go back and read the first two! The plot is intricate, full of twists and complications that require the reader to be paying attention. While reincarnation is the central theme, we're taken through an ancient world of artifacts and the modern world of stolen artwork. Everyone's lives seem to be intertwined, with the past bleeding into the present. The characters are each unique, struggling with their own demons as they find their way. Rose's writing easily dropped me into this made-up world and held me there until the last page. Wow my TBR just grew by two. After reading this book I must read the two prior in the series. While as a stand alone it more than delivers but to be able to enjoy two other of these masterpieces only adds to the joy I had from this one. Lucien is a character to connect with and love. Even when he thought he was going insane I felt the fear that created in him, the doubts he had. All the elements of a cross genre novel...which means it's awesome on so many levels. History, mystery, romance, action, adventure, paranormal all mesh together for one fabulous and life questioning read. 3.75* I enjoy this series & this one was good, but I sometimes had trouble pulling all the characters together. I will definitely go back and read the first two. Read... I think listening to this one on audio was hard. There are quite a few points of view, and although the narrator was spectacular, I didn't always catch that I was in a new character's head until a few lines passed. That being said, this book needed all those threads. Loved the history, and the underground library, and all the art. I didn't guess the murderer until near the end. Then, it made a lot of sense. Good job, M.J. I checked this out I will definitely go back and read the first two. Read... I think listening to this one on audio was hard. There are quite a few points of view, and although the narrator was spectacular, I didn't always catch that I was in a new character's head until a few lines passed. That being said, this book needed all those threads. Loved the history, and the underground library, and all the art. I was going to give this story just three stars but then the last third of the book reeled me in. I was having a little bit of trouble with the various characters and keeping track of who they were, but that may just be me. It was definitely a good story though and I love MJ Rose's unusual twists in all of her books. Great mystery and insight into the art world and museums. Lots of historical elements. Very well researched and interesting book with great plot, kept me guessing until the end. 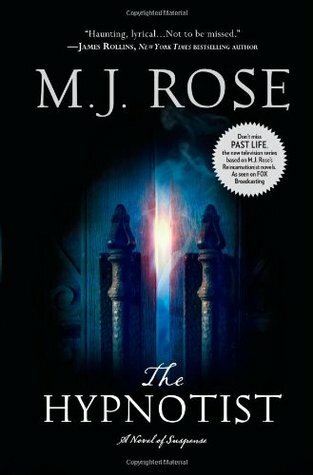 I enjoyed the past life elements and MJ Rose provides wonderful substantiating facts and validity for the case for past lives. I really like how this element is key to the characters and story line. Very good book. In The Hypnotist, Lucian Glass, working with the Art Crime Team (ACT), goes undercover to investigate the destruction of some very old and valuable paintings. While he's undercover he submits to being hypnotized. It's during these sessions that he travels back in time and learns of his past lives. As he does so, he learns new information that just might help him solve the mystery in his current life. I really enjoyed reading this book. It grabbed me on the very first page, which doesn't usually In The Hypnotist, Lucian Glass, working with the Art Crime Team (ACT), goes undercover to investigate the destruction of some very old and valuable paintings. While he's undercover he submits to being hypnotized. It's during these sessions that he travels back in time and learns of his past lives. As he does so, he learns new information that just might help him solve the mystery in his current life. I really enjoyed reading this book. It grabbed me on the very first page, which doesn't usually happen. I usually need a few pages to warm up to a book. Not so with this one. The story remained compelling throughout the whole book and carried me right through to the very last page. There are many facets and plotlines to follow with this one; it's very intricately woven. I found the storytelling similar to that of James Rollins in that both of their stories jump around in time and follow different plotlines simultaneously. I love books written like this as it makes me work a little to follow the story, remember the characters and decipher the plot. In this case, the extra effort was well worth it. This is the third book in The Reincarnationist Series by this author, but the first one I've read. From reading the outlines about the other books, the stories don't appear to be connected. However, more than a few times while reading this one, I felt like I was missing something in the story, as though something relating to this story had happened in a previous book. It didn't at all stop me from really enjoying this book, but perhaps I should have read the others first. The book contains interesting information about reincarnation, art work and painting in general. I'm not sure I totally believe in reincarnation, but I do find the subject matter extremely fascinating. As for the art and artists featured in this book, I don't know a lot about it and can't say I'm a huge fan. I do, however, find the whole art scene very intriguing. Equally intriguing was the explanation of Hypnos's third eye and its potential connection to the pineal gland, "which produces melatonin, the hormone that affects the modulations of wake/sleep patterns and seasonal functions"(page 171), as well as other more elegant and mythical explanations. All fascinating stuff. I read this book in eBook form on my Sony eReader. Highly recommended. I already have The Memorist on my to-be-read bookshelf and can't wait to dig it out and read it. I'll keeping my eye out for The Reincarnationist so that I can read that one, too. For more information about this book or to browse inside, please visit Mira'swebsite. For more information about the author and her other books, please visit M.J. Rose's website and blog. I'd like to thank Tracee Gleichner from Pump Up Your Book and the author for this review copy. Click here for information on the blog tour. The Hypnotist by M.J Rose, Mira Books, ©2010. ISBN 9780778329206(eBook), 412p. This is a series review. Original post at Layers of Thought. A page turning paranormal thriller series with historical fiction and an ancient religious belief system embedded in the stories. Mini Synopsizes ~ The Reincarnationist: Some precious stones with paranormal properties have been stolen from a newly discovered pre-Christian archeological site in Rome, dating around 400 AD. The stones purportedly can help one to remember past lives. The story is primarily set in the present but moves back in This is a series review. Original post at Layers of Thought. The story is primarily set in the present but moves back in time to the 1800s and to 400 AD - with linking story lines through the past lives of several of the main characters. The Memorist: The second book has music at its core, where another antiquity is found which also purportedly helps one to remember past lives. It is called a memory flute. This story is set primarily in Vienna where the flute has connections to Beethoven and ancient Hindu reincarnation beliefs. Also included are a few key characters from The Reincarnationist, making the first book an important first read. The Hypnotist: This third in the series, is a story based around an ancient statue of the god Hypnos. However, this artifact has powers which are more mystical and powerful than the above two antiquities. Within The Hypnotist are connections to The Metropolitan Museum of Art – in New York, so the story revolves around art as well as some of the legal issues around US ownership of foreign artifacts. To complicate things there are Islamic factions wishing to claim the statue as a lost national treasure. All three connected books have people and groups vying for these paranormal items for nefarious and pure reasons. All mixed up with murder, drama, historical and factual data, as well as the paranormal - making the books, at times, heart pounding reads. My thoughts: This is an excellent series combining historical fiction, paranormal, ancient religious belief, and cultural information all within page turning thrillers. The books can be seen as an interesting way to begin to understand reincarnation through a variety of religions - Kabbalahism, Pre-Christian Paganism, pre 400 AD Christianity, Hinduism, Buddhism and more. Weren’t the highest echelons of the church worried about the magic stones? And for good reason. If man discovered that Nirvana was within his reach – if it was in his own hands, not in the hand of God – What authority would the church hold over him? This is interesting when looking at if from the perspective that various religions through the centuries have been extinguished for reasons as suggested above – fear of loss of power, and control of their adherents. (The books include much of this type of insight). As for the actual writing – Rose has a style that flows so easily that one may think it would be easy to replicate. However, it is often the experts who appear to make their art look simple. I am thinking that this is the case with this author. I also like that the books have been written with short and exciting chapters so they are easy to pick up and put down, but one could carry on and complete each of the books in a couple of sittings. Also included at the end of the books are listings for further reading, for those so inclined. I hear that the latest of the series, The Hypnotist, is not the last of the collection. I am looking forward to reading more about the other “memory tools” the key elements of the series. This book was incredibly good--there is suspense and mystery, history and romance, all blended and paced perfectly. Just as Book 2 used music as a central theme, this book uses visual art, specifically painting and sculpture. Just as in Book 2, I love the historical details. (The author explains at the end what is fact and what is fiction, for those who have not yet read the book.) Add to this rich mix the subject of reincarnation, and you have a powerful, fascinating story. You don't have to b This book was incredibly good--there is suspense and mystery, history and romance, all blended and paced perfectly. Just as Book 2 used music as a central theme, this book uses visual art, specifically painting and sculpture. Just as in Book 2, I love the historical details. (The author explains at the end what is fact and what is fiction, for those who have not yet read the book.) Add to this rich mix the subject of reincarnation, and you have a powerful, fascinating story. You don't have to believe in reincarnation to enjoy it; you can think of it as a "paranormal" element, like time-travel. I find it exciting, though, that there is an author who dares take on the taboo topic of reincarnation. (Taboo in Christianity, but not in the Jewish Kabbalah.) Many Christians believe that reincarnation isn't real because 'there is no mention of it in the Bible'. That's what we've been taught anyway, in the mainstream Christian Church. But the more I've read over the years, the more I question that. It's well established among Biblical scholars that the Roman Catholic Church took gross liberties with the Scriptures, "cherrypicking" (popular word these days) what they wanted in the official Biblical Canon. (Not to mention intentionally 'mistranslating' certain words, like calling Mary Magdalene a prostitute when she was no such thing.) One of the things that the RCC axed was the notion of reincarnation. Why? For CONTROL. It makes sense, really: In order to maintain power, the RC Church had to keep the masses ignorant and afraid. Priests read Scripture in a language people didn't understand for a reason, told people that this life is IT for a reason. Told them that Aunt Nelly would roast in Hell if her survivors did not pay a hefty sum for extra prayers, or she would escape purgatory/reach heaven sooner if her relative would only make a 'small' donation. Priests led people to believe that only the priest could communicate with God and intercede on their behalf. (Which is why the RCC branded Luther a heretic: He told people for the first time, in their own language, that they could pray directly to God themselves and didn't need a priest to do so on their behalf.) Church officials probably feared that if people knew they had unlimited "do-overs" they would ignore the Church, ending priests' lucrative careers and cushy lifestyles. According to Biblical scholars today, early texts actually mentioned reincarnation quite frequently, both in the New and the Old Testaments. Jesus Himself was said to be the reincarnation of the Old Testament prophets, 2000+ years ago being His final incarnation before returning to Heaven for all time. All there is left in today's Bible are a few cryptic phrases here and there alluding to reincarnation; all overt mention is gone. In a way, I think the notion of reincarnation makes some people scared, less secure about the afterlife, because it makes them/us realize it might not be as easy as we thought, that we can't keep sinning over and over then suddenly convert at the end. It just doesn't work that way. It might be sobering for some to think that there is no shortcut, no get-out-of-jail-free card, only more 'homework,' if you will. Like God is a good parent, patient and loving but strict, willing to wait forever until we get it right--so we might as well start acting with humility and love now and save ourselves a few millennia. The Hypnotist is book three in The Reincarnationist's series. It is a mystery suspense thriller with mild to moderate expletives and violence. Lucian Glass works for the FBI as part of their Art Crimes Team who has a past surrounded by murder and mystery. At nineteen, he returns from his artist studio, to find his girlfriend murdered and hanging amongst the picture frames of her father's framing business. However, before Lucian can react, he too is attacked and left for dead, now twenty years lat The Hypnotist is book three in The Reincarnationist's series. It is a mystery suspense thriller with mild to moderate expletives and violence. Lucian Glass works for the FBI as part of their Art Crimes Team who has a past surrounded by murder and mystery. At nineteen, he returns from his artist studio, to find his girlfriend murdered and hanging amongst the picture frames of her father's framing business. However, before Lucian can react, he too is attacked and left for dead, now twenty years later, that past is coming back to haunt him. Dr. Malachai Samuels is a long-standing reincarnationist who is obsessed with proving that people's souls do, in fact, reincarnate into other bodies. His speciality is working with children, like little Veronica who begins her tale in ancient Persia, he hypnotizes the children and does past regression therapy upon them. However, Veronica's tales are tying into the memory stones that he desperately seeks, and he will stop at nothing to obtain them. Emeline Jacobs is a cousin of Solange's who has been adopted by Solange's parents, shortly after her murder. In a desperate need to feel wanted, her family was killed in an accident, Emeline begins to take on the persona of Solange. Causing her aunt and uncle to whisk her from doctor to doctor trying to uncover the secret of Emeline's uncanny mannerisms of her late cousin. Samimi is an Iranian who is working to return a statue of the God, Hypnos, back to his country. He and his people know the secrets of the statue and will cheat, lie, steal and murder to regain control of the piece, which now sits in the restoration department of the New York Metropolitan Museum. Samimi works for a boorish, murderous oaf and wishes to displace him, fearing he will be called home to Iran or worse, murdered, he works to bring salvation to his people while keeping his own self alive and intact. Each person moves separately towards their destinations not realizing they are all being directed to the same point in time. As each of the characters come to realize they are but a small piece in a bigger game, they must come to terms with their past, in order to preserve their futures. I absolutely enjoyed the book and loved all the historical references to the art pieces mentioned throughout the story. My favourite painter is Monet and reading about his work was very interesting, as were the informative pieces about Matisse, Van Gogh and the mythology behind the statue of Hypnos was equally enthralling to read. I wish there had been more of it dispersed throughout the book. I loved the blending of the past with the present with the past life transgression therapy and appreciated the tales being told through both Veronica and Lucian. The tie-ins of all the participants was well-written and convincing. The Hypnotist by M.J. Rose is a different kind of mystery/thriller than I usually read in that it has an intriguing mix of mystical lore, ancient mythology, psychology, and action. I haven’t read any of the previous novels in the Reincarnationist series, and while that did not deter from my enjoyment of The Hypnotist, references to the overarching story thread running through the series provoked my interest in picking up The Reincarnationist and The Memoirist. As I understand it, the pursuit of Memory Tools and how to utilize them to access past life memories are the main themes of the series. In The Hypnotist, an enormous piece of ancient sculpture called Hypnos has been found and various shadowy organizations are doing everything they can to get it, such as mutilating priceless pieces of art. And some even commit murder. Why do they want it? It seems that Hypnos has an intrinsic worth beyond the artistic. "It is believed that four to six thousand years ago, in the Indus Valley, mystics created meditation aids to help people go into deep states of relaxation during which they would have access to past-life memories. There are twelve tools-twelve being the a mystical number that w see repeated all through various religions and in nature...The first was a cache of precious stones, and the second was an ancient flute made of human bone." "We're talking about more than just a piece of sculpture...It appears that Hypnos could be a map of sorts that holds the secret to how man can access his inner realms and higher consciousness, making visions, clairvoyance, precognition and out-of-body experiences all possible. If tapped, this power would allow man to use his imagination to affect reality. You'd just imagine murdering someone and your imagination would make it happen...Is there anything more valuable than potential...Than possibility?" The motivations of the bad guys are varied and surprising, but Hypnos’s personal connection to the protagonist, Lucian Glass, was the most exciting part to read. Lucian’s tries to figure out why he keeps drawing agonized faces of people he’s never met. Coincidentally, or not, once he undergoes hypnosis, he finds out that his past lives have intersected meaningfully with the statue. Perhaps in the present, he can put to rights the tragedies in his past lives. Lucian is a different sort of action hero in that he’s also an artist and a sensitive soul. I loved reading all the rich descriptions of art and scenes of creative expression. There is a motif repeated in the book which struck a chord in me, that there is no such thing as coincidence. Seen from the perspective of reincarnation, what is perceived as coincidence is actually a significant pattern running through one’s lives, past and present, that has to do with one’s purpose. I’m not sure if I wholeheartedly believe in reincarnation – I’m leaning towards belief – but The Hypnotist was an entertaining, fast-moving adventure that provoked much thought. Haunted by his inability to stop the murder of a beautiful young painter twenty years ago, Lucian Glass keeps his demons at bay through his fascinating work with the FBI's Art Crime Team. Investigating a crazed collector who's begun destroying prized masterworks, Glass is thrust into a bizarre hostage negotiation that takes him undercover at the Phoenix Foundation -- dedicated to the science of past-life study. There, to maintain his cover, he submits to the treatment of a hypnotist. Under hypnosis, Glass travels from ancient Greece to nineteenth-century Persia, while the case takes him from New York to Paris and the movie capital of the world. These journeys will change his very understanding of reality, lead him to question his own sanity, and land him at the center of perhaps the most audacious art heist in history: a fifteen-hundred-year-old sculpture the nation of Iran will do anything to recover. What Stephanie Thought: Art trade and theft is one of those subjects that don't come up that often -- at first glance, you wouldn't at all suspect how corrupt and controversial of a market it is. In The Hypnotist, it's revealed that art deals are actually one of the most illicit in the black market, third to the drug and arms trade. The book begins with the murder of a beautiful girl. She never did any wrong; she just happened to be standing in the way. This demonstrates how hungry, and how desperate some art dealers are. They would even kill to get their hands on the right artwork. In this case, it's the ancient Persian statue of Hypnos, or the god of dreams, that has no official ownership due to its complicated political history. That is, until hundreds of years later, when Iran claims that it's been theirs all along, and threatens to destroy the originals of a few well-known legendary masterpieces, if they don't get it back. To maintain his high-profile identity, agent Lucian Glass goes undercover as a troubled artist and sees a psychotherapeutic hypnotist. The process of hypnosis reveals a startling and vicious past, and eventually tells the whole story of how Hypos's statue's fervor began, and why it's so desperately desired in the present. M.J. Rose writes with complexity and poise; I am really impressed by her authoritative tone and thought process. However, there was a little too much for me in this book. Too much information, too much detail, and as a mystery novel, rather than keeping me at edge with every page, I soon became weary of its wordiness and seemingly endless plot. As a critic, I am intrigued and enchanted by The Hypnotist's intricate detail, but as a reader, there isn't too much praise I can give to the overall story. Stephanie Loves: "Objectivity is overrated. Passion is much more productive." Mom's Review: Having read the first two books in this series, “The Reincarnationist” and “The Memorist”, I must say that though the first two are really very good, this book is the best of the three. While the first two books were enjoyable enough for me to continue with the series, “The Hypnotist” is an excellent read, with a slightly faster pace, and it leaves me looking forward to the next book. It was captivating enough that I read the book in one day because I literally did not want to put Mom's Review: Having read the first two books in this series, “The Reincarnationist” and “The Memorist”, I must say that though the first two are really very good, this book is the best of the three. While the first two books were enjoyable enough for me to continue with the series, “The Hypnotist” is an excellent read, with a slightly faster pace, and it leaves me looking forward to the next book. It was captivating enough that I read the book in one day because I literally did not want to put it down! The ongoing theme throughout the books is the acquisition of certain “memory tools” that allow the users to see clearly into all of their past lives, thereby proving that reincarnation exists. The problem is that the “tools” are scattered around the world and that no one knows for sure exactly what each tool is, let alone where it is located, or even if it still exists. The search for these tools takes the reader around the globe, while characters search for clues in libraries, old documents, letters and buildings, encountering espionage, murder, theft and a variety of other crimes along the way. Meanwhile, certain characters experience “past life” regressions, both through hypnosis and spontaneously, but only in small segments and out of context to the character, but not to the reader. I think what makes this series so enjoyable is that we all would like to think that not only will there be a chance to “do over” past mistakes, but that there is a purpose to our lives. The human condition wants us to believe that we will go on endlessly and death isn’t really an end at all. Rose weaves an imaginative storyline, capturing all the nuances needed for the reader to care about the characters and enjoy the suspense and intrigue of the story. Her plot development is excellent and the reader can easily follow the storyline, and her descriptions of exotic locales and well known sites is deatiled. I usually do not enjoy books that move back and forth between characters and settings almost every chapter because I have found it disrupting, but Rose uses this method (in all three books) in the best possible way, actually making it easier to follow the different motives and the actions/reactions of all the principals in the plot. And she does so in a totally unobtrusive manner. She moves smoothly between past and present and even the “past lives” segments fit easily into the story and make total sense to the storyline and character development. When it comes to the thriller genre, I'm not often entertained. I've tried reading a couple of Dan Brown novels and couldn't get beyond the first fifty pages or so. And while I finished a Robert Ludlum novel a few years back, anything in it that didn't involve a gun fight or brawl disappointed me to no end. I did manage to find enjoyment recently in Layton Green's The Summoner, which offered a little bit of supernatural atmosphere into the plot, so when approached to review this thriller/mystery When it comes to the thriller genre, I'm not often entertained. I've tried reading a couple of Dan Brown novels and couldn't get beyond the first fifty pages or so. And while I finished a Robert Ludlum novel a few years back, anything in it that didn't involve a gun fight or brawl disappointed me to no end. I did manage to find enjoyment recently in Layton Green's The Summoner, which offered a little bit of supernatural atmosphere into the plot, so when approached to review this thriller/mystery with an exploration into the past lives phenomenon, I figured I'd give it a chance. The book is the third in a series, so I was at a bit of a disadvantage as a reader, but the necessary bits of backstory were laid out pretty well through the novel so I didn't feel lost at all as I read along. Lucian Glass is an FBI agent and member of the Art Crimes unit, called in to investigate the theft and subsequent destruction of a Matisse painting, an act followed by a threat that more priceless--and stolen--paintings will be destroyed unless a coveted sculpture is given up by the Metropolitan Museum of Art. From this point, Lucian is swept up in a sweeping mystery that has him trying to find the culprits behind the blackmail, thefts, and threat of terrorist action, as the massive sculpture of Hypnos is coveted by multiple parties. On top of that, Lucian is haunted by a slain lover from years past, whom he sees in the eyes of another, a woman who may be the reincarnation of his lover, or a simply using Lucian's past as a way to manipulate him for her own gains. The book had a good flow going through it, despite a plethora of characters and shifting points of view in chapters so short I barely had to turn a page before a new one began. Short chapters do well to give the feeling of a taut pace, but points of view shifted so suddenly at times, it felt a bit jarring. The characters are well crafted and most come off in believable fashion as they maneuver through an unbelievable plot. The end gradually ramps up and finishes off with a satisfying end, but as a reader who hadn't read those first two books, despite each one being a stand alone novel, I felt a bit out of place when the dust had settled because any ground rules established in the first two books were a bit foreign to me. FBI agent Lucian Glass has been investigating the co-director of the Phoenix Foundation, Malachi Samuels, for well over a year. The man is suspected in the death of at least one person in his quest to obtain the ancient memory tools that he thinks will allow him to remember his previous lives. Nothing is more important to him, he is single minded but very, very careful. Thus far, Lucian has been unable to find anything more than circumstantial evidence of Malachi's guilt. Meanwhile, Lucian is bat FBI agent Lucian Glass has been investigating the co-director of the Phoenix Foundation, Malachi Samuels, for well over a year. The man is suspected in the death of at least one person in his quest to obtain the ancient memory tools that he thinks will allow him to remember his previous lives. Nothing is more important to him, he is single minded but very, very careful. Thus far, Lucian has been unable to find anything more than circumstantial evidence of Malachi's guilt. Meanwhile, Lucian is battling his own demons. Twenty years ago, when he was an art student in college, his girlfriend Solange was brutally murdered in her father's art framing shop. Lucian arrived in time to find her body and become the second victim. He actually died for a minute and a half in the back of the ambulance. He physically recovered but put all his artistic abilities behind him and devoted himself solely to his job in the Art Crime Team unit of the FBI, tracking down the theft and fraud of priceless antiquities. He had been able to perform his job very well, until a recent event in Vienna (covered in the author's previous book, The Memorist). Lucian heard a ancient melody played on a specific instrument, as many others did. Since then he has been plagued by nightmares and visions of the faces of people he's never met. He is compelled to draw the people that he sees nightly in his dreams. When the Metropolitan Museum of Art receives a destroyed Matisse painting that had been stolen years before, Lucian is called in. The painting was delivered with a note, the sender wants a recently rediscovered ancient statue of the Greek god Hypnos that the Met owns. And he's not the only one that wants it. Iran and Greece want it too, both claiming that it originated in their countries and should be returned. At first the case against Malachi Samuels and the one involving the Matisse and Hypnos don't seem to be related, though gut instinct tells Lucian that they must be. And then he realizes that the Matisse was one of the paintings stolen the day he was attacked, that long ago day when Solange died. As the pieces of his life circle in upon themselves, Lucian struggles to solve both cases as well as his own history, both in this life and beyond. I really enjoyed this entire trilogy: The Reincarnationist, The Memorist and The Hypnotist. It is a bit hard to summarize this one, there are many interwoven characters who are all integral to the outcome. Each book is an intriguing thriller with satisfying ancient mysteries and intricately woven plots...they do keep you guessing and are a fast paced, wild ride! I think each one could be easily understood on their own but there are overlapping characters, so my recommendation is to read them in order if you can. The Hypnotist is the third installment of M. J. Rose's Reincarnationist series, and it does well as a stand-alone title (a big plus in my book). Lucian Glass is an FBI agent, part of an elite unit called ACT (Art Crimes Tactical Unit). A former artist who lost a love and almost lost his own life twenty years ago due to an art-related theft, he lives for the job. His job right now is to uncover who is behind an attempt to barter Hypnos, an enormous elephantine artifact, from the Metropolitan Museum of Art in exchange for previously stolen works of art. Iran and Greece are both laying legal claim to Hypnos, but there are others, including his current arch-nemesis, Dr. Malachai Samuels of the Phoenix Foundation, who believe that Hypnos may hold an important Memory Tool, an object which can help the owner of it access their past and gain power. In his undercover role, Lucian himself becomes a patient at the Phoenix Foundation, where under hypnosis, what appear to be his own past lives are uncovered. He also finds out about a young child who is experiencing visions that appear to be from her own past life. All of these lives seem to center around a sculpture that may or may not be Hypnos. Added to the mix is the fact that the artwork to be bartered also has a tie to Lucian's near-death twenty years ago. There is a bit of everything in this novel. I found myself interested in many facets, but I especially loved the looks into Lucian's past lives. I found myself a bit confused here and there. For instance, I didn't "get" what the heck Memory Tools were for until quite late into the book, and as they play such an integral part in the reason why Dr. Samuels is obsessed, it would have been great to know what they really were much earlier. I also think that there were far too many subplots - one or two could have been set aside to make the read not QUITE so convoluted. That being said, this is the type of novel that could be made into a killer thriller movie. I still don't believe in reincarnation, but, for just a moment or two during the reading, I may have :) I would have liked to see more depth of character, but in a thriller, that's just something that I sometimes make do without. This one kept me turning the pages, anxious to see who ends up with Hypnos in the end. I'm going to admit right now that I loved the beginning of this book. It starts with such a violent act that I was a little stunned by the suddenness of it. As I was reading it, I was struck by the randomness of the act. It's only later that I found out the killing wasn't so random. Despite how cool the beginning was, I almost gave up on this one within the first few chapters. Lots of characters don't normally get annoying as quickly as they did this time out. There were so many thrown at me so I'm going to admit right now that I loved the beginning of this book. It starts with such a violent act that I was a little stunned by the suddenness of it. As I was reading it, I was struck by the randomness of the act. It's only later that I found out the killing wasn't so random. Despite how cool the beginning was, I almost gave up on this one within the first few chapters. Lots of characters don't normally get annoying as quickly as they did this time out. There were so many thrown at me so quickly, that I got annoyed rather suddenly. I stuck with it though and by the end, while I can't say I was in love, I really enjoyed this one. One thought I had about this was that it reminded me of watching a movie, one that quickly cuts back and forth between scenes in order to familiarize the audience with the players. It's a technique I never think about when watching a movie, but tends to come across as too heavy in a book. I loved the mix of art, history, mysticism, and mystery. Outside of the occasional Dan Brown or Katherine Neville book, I'm not normally reading too much that combines them all. I enjoy learning while I'm reading and this book allowed me to do that. Art history is not something I have studied in the past or am likely to study anytime soon. So I have to get the gleams of knowledge out of books like this. The parts of this book that dealt with art and it's creation were my favorites. Once the book got into the realms of hypnotism and reincarnation, subjects I'm unsure of myself, I stayed interested but never fully engaged. There were some beautifully rendered scenes, when under hypnosis, Lucien is taken back to some of his past lives, lives that played a key role in his current case. I found it to be a little too coincidental, but from what I understand of reincarnation, it makes sense. Lucien, if the past lives are to be believed, is caught in a cycle that is forcing him to right the wrongs of his past and protect those who came back with him, something he failed to do earlier. It's a fascinating subject that one of these days I'll study more and figure out my own beliefs on it. M. J. Rose's Reincarnationist series is popular, but I've remained skeptical. I find reincarnation kind of goofy. Objectively, reincarnation is far less goofy than vampires or fairies, which I like. I prefer to treat it like magic instead of something serious, however, because if I take it seriously I find it kind of horrifying. But I did enjoy Kirsten Miller's THE ETERNAL ONES, so I decided to give Rose's THE HYPNOTIST a chance. I have not read the first two books in the series, but I caught up M. J. Rose's Reincarnationist series is popular, but I've remained skeptical. I find reincarnation kind of goofy. Objectively, reincarnation is far less goofy than vampires or fairies, which I like. I prefer to treat it like magic instead of something serious, however, because if I take it seriously I find it kind of horrifying. But I did enjoy Kirsten Miller's THE ETERNAL ONES, so I decided to give Rose's THE HYPNOTIST a chance. I have not read the first two books in the series, but I caught up pretty quickly. Lucian Glass is an FBI agent specializing in Art Crime, who is obsessed with proving that Malachai Samuels is a criminal. Samuels is a member of the Phoenix Foundation and dedicated to proving that reincarnation exists. In order to do so, he is trying to find Memory Tools, mystical objects created long ago to help people remember past lives. I found most of Rose's approach to reincarnation palatable, but I'm still giggling over the Memory Tools (which include a "fragrant pot of wax"). At the same time, there are a variety of odd things happening at the Met. There's a legal battle over the ownership of a dilapidated statue of Hypnos. Paintings that had been bequeathed to the museum, then stolen, are now being returned - in pieces. The construction crew on the new Islam wing keeps losing workers. And all of these things are possibly related. The subtitle proclaims THE HYPNOTIST to be a novel of suspense. Rose takes an approach I'm not overly fond of - you know whodunit from the beginning, but you don't know why. (Well, there are a ton of crimes in THE HYPNOTIST. You know who done most.) At the same time, discovering why is most of the fun. Rose keeps the pages turning, which is the most important thing for me in the suspense genre. As I said, there are a lot of crimes to explore. Rose thankfully doesn't linger over the terrible things that happen to her characters. The violence is never described in loving detail. At the same time, much of THE HYPNOTIST is in villain point-of-views. It sometimes feels icky.